Maelstrom and the Star-vaders both take their shot. Chrono reaffirms his wish to visit Cray one day. Shiranui learns the true value of Vanguard and that the spirits of his clan and comrades remain by his side. Key Screenshots of Episode 51 of G NEXT. Products confirmed to be on sale at the Vanguard x Buddyfight Festival 2017 at Osaka. ACT (RC): [Counter Blast 1 & Retire this Unit] Look at the top 7 cards of your Deck, search for up to 1 “Chaos” card among them, add it to your hand, then shuffle the Deck. If your opponent has Locked cards, your opponent chooses 1 of their Rear-guards, and Locks it. AUTO: [Counter Blast 1] When this Unit is placed on (RC), if you have a Grade 3 or higher “Star-vader” Vanguard, you can pay the cost. If you pay it, your opponent chooses 1 card from their Drop Zone, and places it on (RC) as a Locked card, during that turn, this Unit gains Power+3000, and if your opponent has 2 or more Locked cards, this Unit gains Power+3000. ACT (VC) 1/Turn: [Soul Blast & Choose 1 face-down with the same name as this card, flip it face-up] If you have a “Star-vader” Heart Card, for each face-up card in your G Zone, your opponent chooses 1 of their Rear-guards, and Locks it. 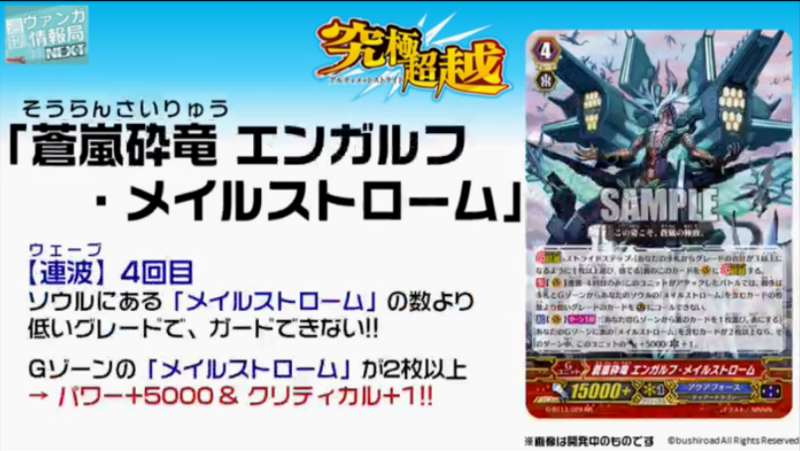 CONT (VC) GB3: For each of your opponent’s Locked cards, your front row “Star-vader” Units all gain Power+3000. AUTO: When this Unit is placed on (VC) or (RC), choose up to 1 card from your hand, reveal it. If that card OR your Vanguard isn’t a “Maelstrom” card, during that turn, this Unit loses Power-5000. ACT (RC) 1/Turn: [Counter Blast 1 & Choose 1 “Maelstrom” card from your Drop Zone, place it into the Soul] During that turn, this Unit can attack from the back row and gains Power+4000. AUTO (VC): [Counter Blast 1] When your G Unit whose original name includes “Maelstrom” Strides, you can pay the cost. If you pay it, choose 1 card from your Drop Zone, place it into the Soul, then choose up to 1 “Blue Storm” card from your hand, Call it to (RC), and during that turn, it gains “AUTO (RC) 1/Turn: When a battle in which this card attacks ends, Stand this Unit.”. AUTO (VC) GB2: [Counter Blast 1] When your turn ends, if you attacked 4 or more times that turn, you can pay the cost. If you pay it, draw 1 card, your opponent chooses 1 of their Rear-guards, and retire it. CONT (VC) Wave-4 Only: During a battle in which this Unit attacks, your opponent cannot call cards from their hand or G Zone to (GC) whose Grade is less than the number of “Maelstrom” cards in your Soul. ACT (VC) 1/Turn: [Choose 1 face-down card in your G Zone, flip it face-up] If there are 2 or more face-up “Maelstrom” cards in your G Zone, during that turn, this Unit gains Power+5000/Critical+1. Ultimate Stride, on sale November 17th, 2017. Bushiroad.